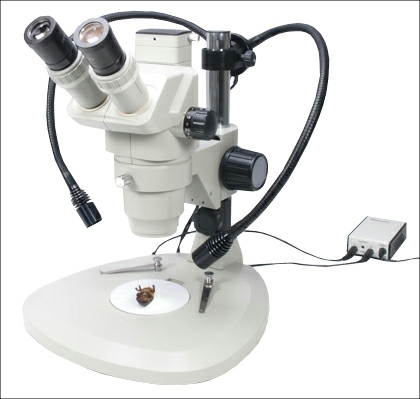 This double arm high power spot light can be attached to most stereomicroscope stands including long arm arrangements. 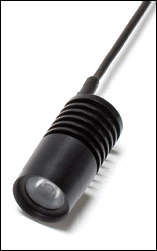 The unit is particularly effective where high levels of light are required in confined space. 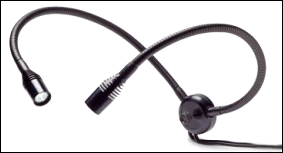 There is a cable feed into the flexible arms from a central control box. The LED light intensity is comparable in output to a 150 watt halogen light source and the control box has rheostat adjustment and the two lights can be used together or independently. Adapters are available to attach the unit to the round columns of stereo stands and a number of specific Leica and Nikon stereomicroscopes. In addition each light source can be fitted with a diffuser lens to soften the light or a polarising filter to remove highlights.